Finding a job is not as easy as we would like it to be, what with the huge number of people looking to make a living, and the economy not doing as well as everyone would want it to. The competition is tough, to say the least, and every job seeker – new graduate and experienced alike – has to make sure he has an edge over other job seekers. And when it comes to finding a job, there usually is no way around it – a resume is needed. But gone are the days when the traditional resume is enough to catch the attention of employers and head hunters. That is not to say that traditional resumes are not being used. They are. There is, however, the fact that there are more resources which job seekers can utilize to catch the eye of potential employers. Enter the social resume. The guys at Online Colleges have put together some data on how digital social resumes are creeping in on the job seeking landscape. As mentioned, the conventional resume still has a solid role in the process, but a social resume should be part of every job seeker’s arsenal today. 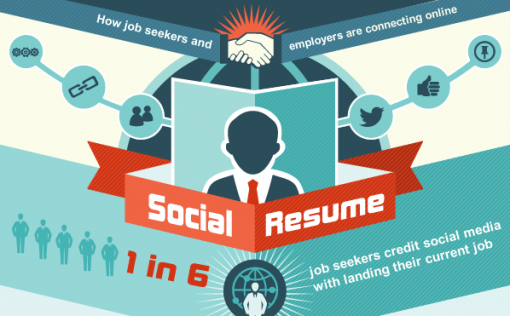 What exactly is a social resume? It’s not revolutionary news – that employers are paying attention to what you put up on social networking sites such as Facebook and Twitter. It is actually more of a reminder, re-emphasizing the importance of being selective about what you post on your social networking profiles. You may not always think hard and deep about your latest tweet or Facebook status. You may not even really care about what you put in your “About” section. But, you really ought to, that is, if you care about putting your best foot forward in your social resume. Here are a few critical things that you should – and should not – include. Profanity – a no brainer! If you think about it, these guidelines might take away the fun of social media. Then again, it all depends on your priorities. If you have serious career goals, you might want to create a profile that is meant for your professional growth and strictly limit access to your personal accounts. Here is the social resume infographic in its entirety for your reference.